We set off walking just before half past nine and headed away from the reservoir along Bradbury Lane past a pretty row of terraced cottages before ascending to the woods by way of Intake Lane. There were good views over the valley towards Alderman's Hill on the far side. We took a direct line of ascent up towards Alphin Pike, which cannot be recommended as it involved wading through deep bracken and heather, crossing a barbed wire fence and ascending some unpleasantly steep ground. However the ground did eventually begin to ease and soon we were walking through much more pleasant ankle deep heather! There were excellent views from the trigpoint on Alphin Pike, and it was clear that we were right on the western edge of the high ground with the flatter land of Manchester spreading out into the distant haze. After feeling suitably refreshed we set off along a pleasant moorland path, sometimes through the heather and sometimes across the bare peat, which was steaming in the heat of the sun. This area was teeming with bugs, but luckily they didn't seem particularity interested in us! Soon we reached the impressive Wimberry Rocks, one of the many gritstone outcrops around the Chew Valley. There were excellent views back down to Dovestone Reservoir from the top of this crag. We continued along the edge past Wilderness, which this particular bit of the moor seems to be called according to the OS map! I tried to identify the top of a scramble I'd done round here some years previously but it was a bit tricky to determine from above! We walked along the dam with good views of the surrounding moorland, with the Pennine Way out of sight only 3km away to the east. By now a chilly breeze had developed, so we sought shelter near the north end of the dam for lunch. There was some uncertainty about which moorland path we should take, and we initially opted for the one with the Peak and Northern Footpaths Society sign, i.e. the public right of way. However after a short while we left this path to head WSW across the moor to pick up a reasonable path along the moorland edge. Again there were excellent views down to Dovestone Reservoir from here, and in fact it had been our near constant companion since the start of the walk! Continuing northwards along the edge we came to an area of crags, below which I spotted the remains of a building that I later discovered is called Bramley's Cot, although its original use is uncertain. It was clearly a well constructed building, with holes cut into the crag itself for the roof, joists and beams. Continuing along the moorland edge we soon reached a large cairn on top of a gritstone outcrop known as Fox Stone, with a memorial plaque commemorating two climbers who were killed in the Dolomites in the 1970s. Soon we reached the impressive crags of Dove Stone Edge, where there were excellent views over the gritstone to Dovestone Reservoir below and Alderman's Hill beyond. Under darkening skies we walked east along the edge of Dove Stone Clough, before continuing northwards to a celtic looking memorial cross. According to the engraved stone this marks the spot where James Platt, MP for Oldham, died due to a shooting accident in 1857. We stopped near here for a coffee and a bite to eat just before the arrival of a heavy shower, which resulted in me walking in waterproofs for the first time in months! After coffee we wandered over to Ashway Rocks before continuing around the edge to the impressive crags of Ravenstones, from where there were good views down to Greenfield Reservoir along with the interesting looking Trinnacle. Our original plan was to descend from near here down to Greenfield Brook below; however the ground looked unpleasantly steep so we continued along the path above Birchen Clough for a few hundred metres before dropping more gently down to the burn. We picked our way downstream, sometimes on a faint path and sometimes just on the bare rocks just above the water. After a few hundred metres we reached the vehicle track alongside Greenfield Brook, which we followed downsteam and then along the northern / western sides of Greenfield, Yeoman Hey and Dovestone Reservoirs to reach the carpark at around quarter to five after an excellent day's hillwalk; it's always nice to walk new ground for me, especially so close to home! Great looking circuit there! 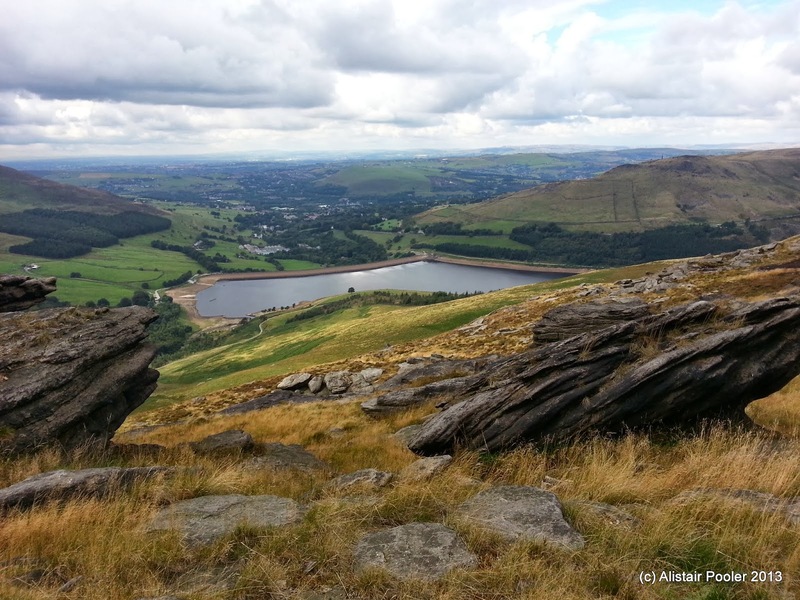 I love it around Dovestone and have a couple of cracking walks round there. Love how wild it feels quite quickly, good place for spotting Mountain Hares too! Thanks! I'd not ventured onto the moors round there before (although I've had plenty of walks around the reservoir with my daughter) and I was pleasantly surprised as to how nice a walk it was :-) Didn't see any mountain hares though. I'm a bit (!!) late in putting my write-up online. What a grand day out we had....even allowing for the fact that you're now a year more ancienter. You'll not catch me up though, that's about the only thing I can keep ahead of you though! Hey, thanks for a great blog post and inspiration! Did the walk today! Only started the other way round and went down before the Alhin, because it's gone cloudy and glomy, so cut the last 3k out :) But it was gorgeous with all that snow and sunshine! Thanks again and happy walks!